Mr. Kuldip Singh, an architect and town planner by profession, and owner of a beautiful collection of Thanjavur and Mysore paintings by passion, speaks about his journey of collecting these pieces of art. His quest and research on various aspects of these painting traditions also illuminates their history, themes and patronage. Sahapedia: Could you please tell us something about your initial exposure, your occupations at the time, and how you started your journey as a collector of such a huge array of Thanjavur and Mysore paintings? 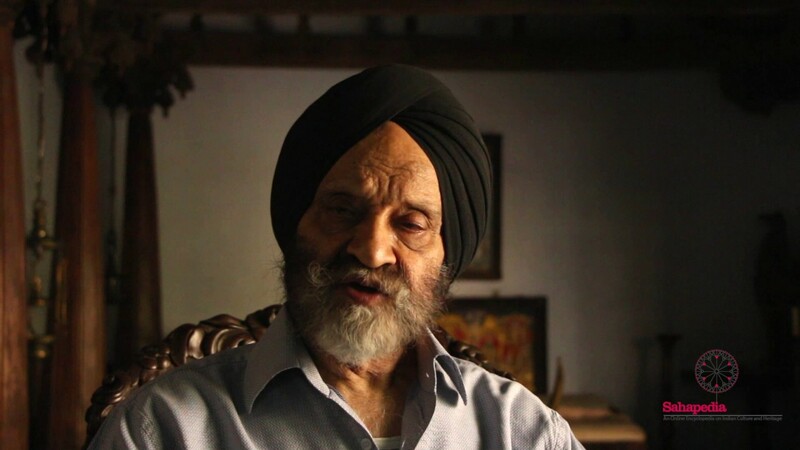 Kuldip Singh: Well, I am an architect by profession, also a town planner and the story of my collection of Mysore and Thanjavur paintings really starts in the early '70s when I had reasons and occasion to travel to south India in connection with my professional work. In South India I was quite intrigued to see a whole lot of fragments of buildings on display in the bazaars—very beautiful, superbly carved doors and all kinds of other artefacts like beams etc. taken out of old buildings. And I was so intrigued by them that I began to buy some. In fact, I bought a whole lot of doors at one time, some very large and beautiful ones. And over a period of time these antique dealers started to show me Thanjavur and Mysore paintings which were not so popular at that time but are very much so now, I mean they wanted to sell these paintings to me. Initially I found them to be somewhat gaudy, because in my mind the benchmark of painting was the miniature tradition of north India, Pahari, Guler etc. which are as far away from these south Indian paintings that any work of art can be. But then once it so happened that I had to pick up a couple of paintings to bring them to Delhi to show them to a friend. And as my friend didn’t seem to like those paintings. I decided to return them to the dealers and left them in my office. For about three weeks I kept looking at those paintings and somehow something happened. I think the paintings grew on me so much so that when I went back to Chennai, I forgot to take them back. When I reached Chennai I asked the dealer there: ‘Do you have more of those paintings?' In response he showed me 10-12 other paintings and I couldn’t help buying a couple of them, while discussing the mythological subject of those paintings. Thereafter it became a bit of an obsession to look at these paintings, whenever I had some spare time from my architectural and planning assignments at Cochin and Chennai; I enjoyed spending time with the dealers as also visiting various museums to look at these paintings. Bit by bit they began to seep into me and bit by bit I began to acquire them. That in sum is how it happened. And then of course it went on and on and on. S: As you have also carried out quite extensive research on these beautiful pieces of art, can you also tell us if you have encountered any of the artists’ families associated with these painting traditions and your interactions and memories of them? K.S. : Once Dr Nayanjot Lahiri the historian travelled with me to Chennai as also to some of the smaller towns around Chennai to interview a few artists. At that time we did collect some material and we talked to several traditional artists. The artists we met were full of knowledge and were able to tell us how the differences over time had arisen between what their grandfathers and great-grandfathers did, and what they themselves were doing now. The essence of the whole thing is that historically speaking, painters in the latter part of 19th century used to travel from village to village looking for patronage. They would settle down for a while in a village where some work was offered. They would then make paintings to the required subjects or specifications of the patrons, be paid very small sums of money which would be supplemented by a place to stay and adequate food. On completion they would move on to the next assignment in another village. Well, to that extent I can talk about the traditional painting and painters as we found them in the mid-'70s. Later on, I have had occasion to talk to a number of traditional painters but their attitude to work, the materials they use, and the subjects that they depict have all radically changed. On the whole the production of paintings is greatly commercialised. And the genre of Thanjavur paintings which has now emerged should be viewed as a subject of study in itself. S: Could you tell us something more about the patronage of these paintings then, when this tradition started? K.S. : You know there are two dimensions to it. According to the available historical literature, the roots of these paintings lie, most probably, in present day Andhra. And it is from there that the Deccanese artists, on account of difficult times prevailing in the 17th century in the Deccans, migrated towards Tamil Nadu and Mysore. There they received patronage from Mummadi Krishnaraja Wodiyar of Mysore and the Thanjavur ruling clan, the Bhonsles. Under the Bhonsle clan this genre took a different direction altogether. S: Does this patronage transform over a period of time in terms of, maybe, what we can see, materials used in these paintings, the precious and semi-precious stones, etc. And does it also reflect in the kind of patronage they, artists received? K.S. : Yes, certainly. The royal patronage was more towards portraiture and towards depiction of court scenes and similar other subjects related to the affairs of the state. But there were other important patrons particularly the Bhajan Maths i.e., the religious institutions attached to some temples as also some very large Bhajan Maths having their own temples. The mythological content of these paintings was ideally suited to project the Puranic narratives of the Hindu religion. The genre can also be subdivided into two streams viz ‘puranic’ and ‘iconic’. The puranic paintings are a counterpart to the superbly sculpted mythological stories depicted on the inner walls of temples and the iconic paintings relate to the deity presiding in the garbhagriha of the temple. The other important thing is that in the later part of 18th century the artists started to replicate these paintings to meet popular demand. For instance, the Krishna theme and the Rama Pattabhisheka, i.e., the coronation of Rama, became very popular subjects. The artists would make several copies of each of these popular subjects, take them to the melas around the temples, where they would be sold to the visiting worshippers. In this way the paintings became an important part of the common man’s domestic puja room. S: Coming on to the thematic representation which you were just talking about, what is your take on the textual or the oral traditions that fed these paintings in the form of thematic representations? K.S. : Well, put it this way, that these paintings are deeply religious, and although some scholars have tried to bring out the European influence on these paintings, in my opinion that is minimal. In reality, the inspiration for these paintings lies in the mythological stories in the Puranas, in the Ramayana and Mahabharata. Also Thanjavur paintings are known to have been inspired by the kritis, the bhajans composed by famous musicians and saints. These form a part of the pool of inspiration which helped the artists to articulate the sacred themes in a visually striking manner. S: How do you see these paintings as icons moving from temples to houses: once formally established in temples with proper ceremonies i.e., ​sthapana rituals or by invoking the deity into the ​murti, they now came to homes in the form of these paintings? K.S. : Yes, it is very important and a subject of study by itself. Firstly the increased production led to enhanced patronage and eventually the icons became an integral part of the puja rooms of the well-to-do. Although the actual puja would be carried out before the small murti already established in the puja room, like the temple itself, these paintings hung on the surrounding walls projected an aura of sanctity. The paintings are always treated with great respect, garlanded and given tilak, and even a bit of prasad is put in front of the painting. Now, it is on account of the Thanjavur tradition that in later periods, i.e. the earlier part of the 20th century, the so-called calendar art developed. Although the popularity of the calendar art is attributed to the efforts of artist Ravi Verma, the inspiration may be attributed to the Thanjavur school. The paintings hung in the puja rooms were by and large not subjected to the rituals of sthapana but later developments suggest that for the masses, sthapana was not a very important ritual. Nowadays, for instance, while calendars or paintings are not subjected to sthapana but at the same time they are treated with great respect. Not only that, the paintings cannot be destroyed without subjecting them to some sort of a ritual of visarjan, lately Thanjavur paintings have become very popular and are being displayed in drawing rooms as well. They are being patronized by the rich. I sense some kind of churning taking place in society, which I anticipate will tend to change the character of the Thanjavur paintings, and bring them out of the repetitive mode into something a little more creative. S: Coming back to collecting, how has your passion grown over the years? K.S. : Well, I would say, it has grown and grown in the sense that I have found a whole lot of missing links in the story of Thanjavur paintings which, I thought, needed to be explored and looked into. One of them has been the dating of these paintings. Paintings are popular these days and were written about by Jaya Appasamy who did an excellent job, although she didn’t have enough material. Over the years enough material has come forward but actual research has faltered. I thought I would get into the dating of these paintings. Secondly, I have realised the importance of this subject as a unique phase in the development of visual arts of south India. These paintings are very fragile and subject to deterioration, on account of the diversity of materials used in the physical structure of the paintings. The materials react differently to changes of temperature and moisture and that leads to very rapid deterioration. Realising these things, I have put my own collection through a conservation protocol. While doing conservation work we stumbled on some dates. Based on this meagre information we worked out a protocol for dating these paintings. I am glad to say that due to the excellent work done by the conservators, we were able to definitively date about 100 paintings. I hope this kind of research goes on. S: Being a collector, how do you think government policies affect art collection or can affect collecting art? K.S. : Well, the government has no policy. I am very sorry to say that we have an Antiquities Act (Antiquities and Art Treasures Act, 1972) which has not been revisited for, shall we say, 45 years now. And the circumstances have changed. The adverse effects of that Antiquities Act have been noted. The Act was framed to preserve and to conserve historical artefacts within the country which I think is a laudable objective and should be pursued, no doubt about it. But its effect has been totally adverse. That is, the archaeological department and busybodies in it started to chase collectors irrespective of whether they were doing anything wrong or not and began to make life difficult for them. Consequently, a whole lot of collectors gave up. Not only that, a whole lot of dealers also stopped dealing in antiquities with the result that, the amount of money which should have gone into preserving this art got diverted into modern art. So, I hope the government reframes its policy and makes it collector friendly so that more and more collectors can come forward and build up collections on various periods of our history which would help to project a well-researched historical perspective to our past, particularly the 18th and 19th centuries.